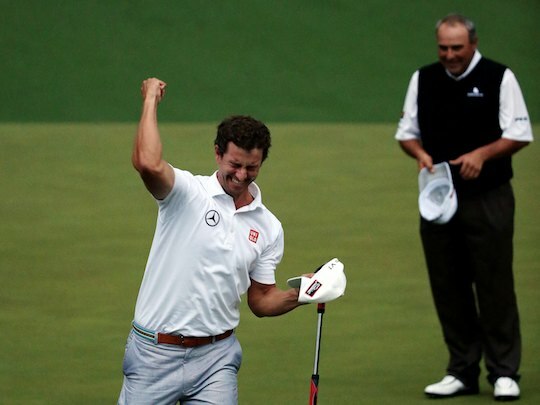 Adam Scott collected his ninth win and first major victory in his 202nd career start on the PGA Tour when he defeated Angel Cabrera of Argentina at the second playoff hole to win the Masters at Augusta National. Scott becomes the first Australian to win the green jacket in its 77-year history. A total of eight Australian’s have runner-up finishes at the Masters. Scott made a 6-metre birdie putt on the second playoff hole at the 10th to clinch the title after watching Angel Cabrera narrowly miss his birdie putt. “It’s amazing, because I wasn’t comfortable with my shot into 10,” said an elated Scott. It was the 17th and second consecutive playoff at the Masters after Bubba Watson also won on the second playoff hole (No. 10) last year. No Masters playoff has ever gone past the second extra hole since going to sudden-death format in 1976 and Scott made sure this year was no exception. Anyone who witnessed the gracious way in which Scott handled his loss at last year’s British Open at Royal Lytham and St Annes was watching a player with the qualities to win a major. Scott gave up a four shot lead with four holes to play only to see his great mate Ernie Els, the unlikely victor. During today’s final round of the Masters Scott’s clarity of thinking was visible on each and every shot – he had learnt from events last year and was not going to let this major slip. “You know, everything I said after the Open is how I felt, and I meant it,” said Scott. Scott’s mettle during the final round and in particular in the play off was second to none. In the past, putting had been Scott’s nemesis, particularly clutch putts from 5-6 feet when the heat was on. Today there was no signs of any troubles with his putter and to win on the second playoff hole with a brilliant six metre birdie putt, after sinking a similar one on the 18th, put to bed any demons he may have ever had with the flat stick. It was simply inspiring golf. Despite the enormity of the moment Scott was just as humble with this victory, as he was at The Open in 2012. “Everything fell my way in the end, I guess, and you just never know,” said Scott. The 32-year-old Queenslander ended decades of near-misses and heartbreak for Australians at Augusta National. Scott also became the 10th Australian to win a men’s major and the first since 2006, when Geoff Ogilvy won the US Open. All of our players served us proud at Augusta with Jason Day finishing a creditable third at 7-under-par after sharing the lead at one stage, a stroke ahead of Marc Leishman who closed in a tie for 4th with Tiger Woods at 5-under.